The Dexter 2333-8 8” Traditional fillet has been a favorite for commercial and charter boat fishermen for decades. 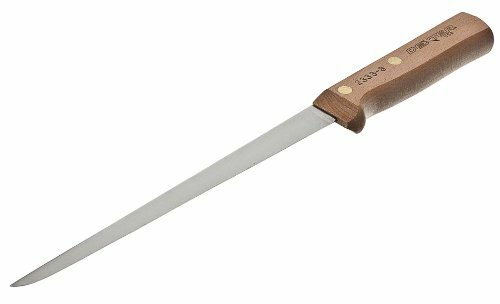 This beech handle knife features a high carbon steel blade that holds an edge and is easy to re-sharpen. The traditional series comes in 5”, 6” 7” 8” and 9”lengths. These knives have a flexible, narrow blade that glides over bones and makes skinning a breeze.Made in U.S.A.Care: Because these have a wood handle and high carbon steel, they should be hand washed and dried. The blade will get a black patina with use. Avoid rust by adding a coat of vegetable oil. Ask the old timers, they swear by them.Recommended sheath #1 leather.